Go nutty and healthy with an exciting range of nuts and seeds from Cornitos this winter season. Everyone’s favorite and India’s No. 1 Nacho Crisps brand, brings healthy and flavored nuts and seeds under its “POP N CRUNCH” range. 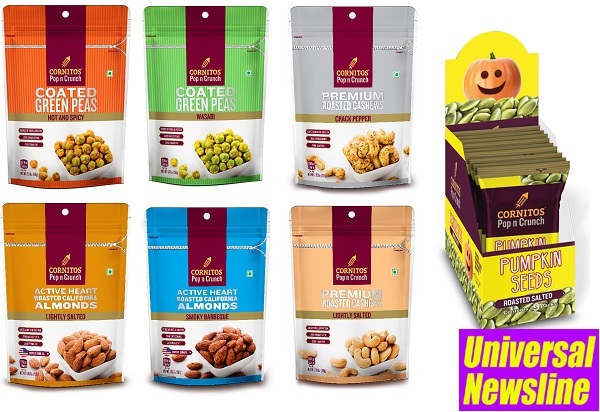 The range includes: Premium Cashews, California Almonds, Roasted Salted Pumpkin Seeds and Coated Green Peas. Premium Nuts and Seeds are processed using latest technology and through imported roasting lines giving uniform roast and a crunchy bite to them. Cornitos Nuts and Seeds are cholesterol free and have zero trans fat Additional health benefits of high protein, fiber and Vitamin E make it suitable for most age-groups. Cracked Pepper Roasted Cashews and Smoky Barbeque California Almonds are a good option for spice lovers. Coated Green Peas are the perfect winter snack that will refresh your palate with an exotic taste of Wasabi and Hot and Spicy. Cornitos Roasted Pumpkin Seed is great in taste and powerhouse of minerals like iron and zinc.. Nuts and Seeds work well on appetizer table or as a great starter to grilled steaks and as an accompaniment with wine. Greendot Health Foods Pvt Ltd was the first company to launch Nacho Crisps in Indian snacks. The production facility at Roorkee, Haridwar district, Uttarakhand, is equipped with state-of-the-art processing machinery and is manned by a team committed to quality. GHFL is ISO-22000 and Halal certified company. It also has registrations from FSSAI and US FDA.